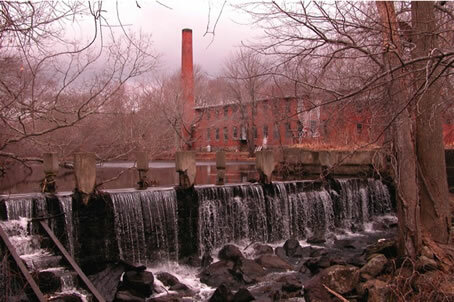 "A FORTRESS OF CREATIVE SOLITUDE"
The historic Shady Lea Mill, situated on the scenic Mattatuxet River in North Kingstown, houses over 40 artists and artisans working in various media. On Saturday and Sunday December 1at and 2nd from 11 to 5pm, The Shady Lea Mill will host its 21st annual Open Studios for each artisan to showcase his/her skills. Just in time for holiday shopping, some of Rhode Island’s many talented residents open their doors to the public and offer a wide array of hand made local gifts. Featured will be one of a kind pottery, sculpture, weaving, fine arts, mixed media, glass blowing and fusing, beautiful work in metals, photography, , jewelry design. Anchor Bend Glassworks is an unprecedented glass artist collaborative established in 2003. This award winning team is comprised of childhood friends Michael Richardson, Justin Tarducci and Timothy Underwood. All met while exploring their shared enthusiasm for art, glass and creation. The talents from each artist encourage and compliment the energy and originality that permeates every piece of hand blown glass that Anchor Bend creates. Their award winning designs can be seen at select galleries and museums nationwide. David Christensen also lends his talents in cane glass beadwork to the Anchor Bend team. His jewelry and other creations will be highlighted at the Open Studios. Julie Munafo, who is one of the cornerstones of the mill makes the most awesome wreaths, frames and pieces of jewelry, selling them online all over the world. Back again this year is the absolutely gorgeous jewelry of Petri Kymlander, our busy "POTTERS", Donna and Jen and Susie Matthews' most unusual Pottery and Felt works of art. Also back is Ursula Bendl with her specialized soaps which you cant miss the upper corridors by just following your nose. How about the paintings of Kim Ellery, Trish Hurley, Jo-Anne Melrose, Ethan French and the beautiful works of our 3 weavers, Susie, Nancy and Judy? This year we have a new addition in this field....Kate O'Donavan is a Spinner. Also new this year is Diane Harrison who uses natural dyes and botanical printing on silk, cashmere and wool scarves, wraps and kimonos. Martin Keen is new this year too. You will find him in Studio 203, having fun experimenting with his many talents. It’s as much a party as a shopping experience as the artists provide food, drink and entertainment ­ as well as demonstrations and explanations of their work so be prepared to be amazed. Around back, a special feature will be a demonstration by Sculptor Elizabeth Lind, in L-1. Some of her students will be there to guide you. As always, The Shady Lea continues to be home to an artistic magic that permeates through every Studio. While admission is free, the artists of Shady Lea Mill are again asking guests to bring a non-perishable food item for the North Kingstown Food Bank. Collection bins will be placed at every point of entry. It has been said the Shady Lea Mill has a pulse of its own, the feel of a community in action. a celebration of diversity! If you haven't experienced us yet, this is the year. Treat yourself and join us. Storm Date: Saturday & Sunday, December 8th & 9th.